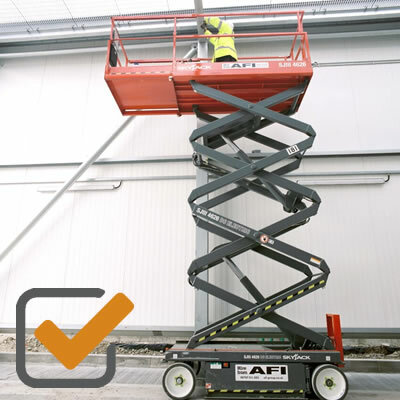 Machine heights quoted relate to the measurement from ground level to maximum platform height, plus an extra 2 metres. Outreach relates to measurement from the centre of the turret plus an extra 5cm, on a fully extended boom. Always check the safe working load of the machine before operating. Calculate the weight of the operative (average male 85kg) plus tools and compare the total to the machine’s safe working load. Ground conditions make a substantial difference to the performance of your machine. Working on a gradient, wet or rough terrain will affect the choice of equipment. We recommend that you discuss this with us before you hire. Depending on how long you need to hire your machine for, this could affect the type of machine that would be best to hire. We offer everything from one day to long term hire. When working indoors we recommend electrically powered machines. Remember to measure any doors through which the machine may have to manoeuvre. Also let us know if you are working on a surface where you will need non-marking tyres or wheel covers. Diesel machines are mainly used outdoors. All machines used outdoors should have a wind rating. Also consider any outreach needed and ground conditions. Standard hire contracts cover Monday to Friday on a self-operating basis. Our 7 Day Service gives you the flexibility to work over the weekend, you pay for the use of the machine on the Saturday and get Sunday FOC! We also offer a 24hr and 48hr delivery service on our core machine ranges. SmartZone and KeyZone options available to prevent unauthorised machine use. And finally, before operating any machine, always remember to read through the machine operator’s manual. All of our machines come with these.